Hi, hey there, hello! Today I'm going to be sharing with you all what a day at my internship looks like! I love watching and reading 'Day in My Life' videos and posts so I thought it'd be fun to share what a day is like! Now, every time I meet with Kat my day is different. Which is what I love about it because it's always something new and exciting! So let's get into my day! 6am// My alarm goes off and I wake up and grab my phone and check my Instagram, emails, Twitter and Snapchat. I usually spend about 15 minutes getting all caught up on what I missed while I was sleeping. 6:15// I mosey on downstairs and make myself a cup of coffee and get some breakfast, usually cereal, waffles or toast. 6:30// Finish drinking my coffee and hop on into the bathroom to get ready. I wash my face, brush teeth, fix my hair, put on makeup and get changed. Typical girl stuff. I also get my things together in my tote: charger, planner, laptop, etc. 7:30// I leave for meeting number one, blasting the radio and jamming out to my favorite songs. 8:30// I arrive at my meeting, which is at one of the local news stations to help film a fashion segment for that morning. Pretty exciting stuff! It's so cool to see the behind the scenes of the morning news and how everything is set up. You can see what we were filming here! 9:20// Kat and I leave for our next meeting which is downtown. 10am// We arrive at meeting number two which is at Posh KC, the blow-dry bar down in the Power and Light District. But first coffee. We head to the coffee shop right next door (a good/bad thing) and order two iced vanilla lattes. Then we head back over to shoot how-to get a blowout done. Kat takes the pictures while I take the notes. I manage to send out a few emails and schedule an appointment. It's always so much fun going to Posh and I always come away learning a thing or two (or ten) about hair! 11:30// Once done with the hair shoot we head over to the coffee shop as our make-shift office for the day. We get right to work. I work on drafting and sending emails, making contact lists, researching and creating social media content. Some may think it's boring but I love it! It's always something new and I'm constantly learning. Plus, it helps that there's awesome coffee and a great techer! 1:30pm// We work for a couple of hours and then break for lunch. We decide to eat at Chipotle, which was soooo good. We eat and chat about what else needs to be done for the week and the upcoming schedule of the next. 2:30// We head back and part ways as I head towards home to run a few errands and such. So that's my day! It's pretty gosh darn fun if I do say so myself and I'm so fortunate to be able to call this work. I mean it's not even really work.... it's more like me getting to do fun stuff and learning and also sending out a few emails here and there. It's kinda the best. I plan on doing another one of these for my 'regular' life too! So be looking our for that sometime soon-ish. 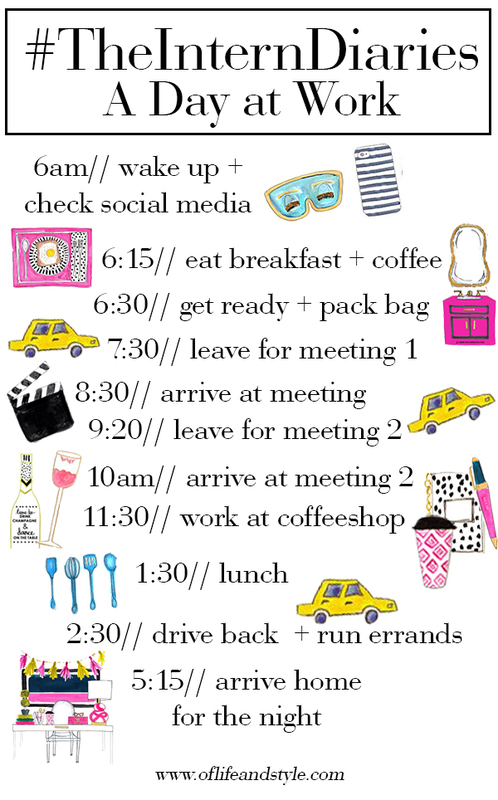 I hope you guys enjoyed this post and if you want to check out the rest of my #TheInternDiaries posts here and here! Oh and follow along on Instagram (@samantha_goble) and Snapchat (samanthagoble) for more on my days and what I'm up to! How does your day look? Either work or regular? Leave me a comment sharing!